A series of reunion performances with original singer Lou Gramm, keyboardist Al Greenwood and multi-instrumentalist Ian McDonald will be featured on Foreigner’s upcoming 40th anniversary tour, according to a new report from Billboard. "They're not on the whole tour, but there will be some appearances," founder and guitarist Mick Jones tells the music industry publication. "It's the right time to do this. I'm looking forward to that and we'll see how it goes, and I'm sure it'll go down well." Greenwood and McDonald were in Foreigner’s lineup from 1976 to 1980, while Gramm handled vocals from 1976–19990 and from 1992–2003. 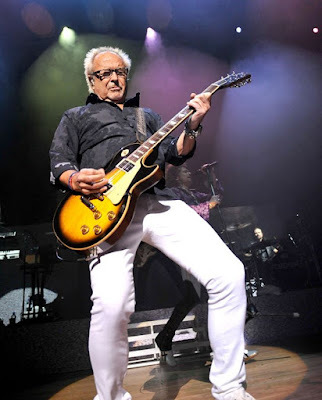 Foreigner’s 37-date, 40th anniversary North American run will begin in Syracuse, NY on July 11 with shows running to September 9 in Auburn, WA; the bill will see the group joined by Cheap Trick and former drummer Jason Bonham and his band. Jones shares a history with both acts: Rock And Roll Hall Of Famers Cheap Trick were a part of Foreigner’s first headlining tour in 1978, while Bonham played drums for Foreigner from 2004-2008. "It couldn't be a better mix for me," says the guitarist. "It's almost like a family tour, with some healthy competition from everybody, I'm sure. Cheap Trick's not an easy band to go on after. Official dates and ticket details are expected this week ahead of the tour’s on sale date on January 13. Foreigner issued the first release to mark their 40th anniversary last November as part of Record Store Day: a 4-song EP entitled “The Flame Still Burns” that also contained a live version of "Juke Box Hero" and the original recordings of "Feels Like The First Time" and "Long, Long Way From Home" from the group’s 1977 self-titled album debut. A two-disc, 40-track anniversary compilation with some brand new material is planned, while Jones will be publishing his memoir, “A Foreigner's Tale”, this spring. Foreigner will launch their 2017 live schedule in Lake Charles, LA on January 27 with their current lineup of Jones, vocalist Kelly Hansen, bassist Jeff Pilson, guitarists Thom Gimbel and Bruce Watson, keyboardist Michael Bluestein and drummer Chris Frazier.